Neurological disorders affect more than 3.6 million Canadians of all ages, and are the leading cause of disability requiring continuing care. According to Brain Canada, the economic burden of neurological and psychiatric disorders combined amounts to $22.7 billion per year in Canada, and the World Health Organization forecasts neurological and psychiatric diseases to surpass cancer as the second leading cause of death in Canada by 2040. Clearly, there is great urgency to identify and implement solutions that create healthier brains. However, to date, the brain’s vast complexity and mutability have permitted only incremental progress in this regard. The Healthy Brains for Healthy Lives (HBHL) initiative is a high profile, high priority multidisciplinary and cross-sectoral initiative located at McGill University made possible with support from the Canada First Research Excellence Fund (CFREF), Quebec’s Ministère de l'Économie, de la Science et de l'Innovation (MESI), and the Fonds de recherche du Quebec (FRQS, FRQSC and FRQNT). HBHL builds on McGill’s scientific excellence and global leadership in areas of neuroscience that hold the greatest promise for delivering implementable, clinically effective outcomes in brain and mental health. It aims to transform many brain disorders from terminal or life-long afflictions to treatable, even curable, conditions. The central vision of the HBHL initiative is to reduce the human and socio-economic burden of psychiatric and neurological illnesses, and improve the mental health, quality of life, and productivity of Canadians and people around the world. This will be done by elucidating how the individual brain functions in health, in disease, and throughout our lives using world-leading neuroinformatics integrating genetic, epigenetic, neurophysiological, imaging, behavioural, clinical, social and environmental data. Research: Encourage interdisciplinary and novel approaches to research across fields linked by neuroinformatics to: understand the individual brain in health and disease, improve brain disease and mental health diagnosis and treatment, and generate new preventative measures and social programs for brain health. Talent: Train and support young researchers in neuroscience and interdisciplinary approaches to the brain in health and illness. 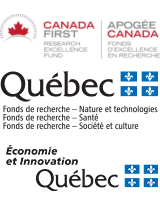 This includes recruiting 21 new McGill faculty focused on HBHL key disciplines. Innovation: Foster international collaboration, and support early stage commercialization and knowledge mobilization of HBHL supported discoveries. Infrastructure: Develop novel technologies and support core facilities that are key to achieving HBHL’s goals. McGill will partner with researchers at Western University, which is receiving an additional $66 million from CFREF, to leverage complementary expertise to better understand disorders such as Parkinson’s, Alzheimer’s, traumatic brain injury, and schizophrenia.